If you're searching for a rug collection that is made in a modern style and design, with bold and harmonious colours and tones, look no further than the Guayama collection. These stunning and complementary rugs are available in a range of bold shades, including red's, yellows and blue's plus many more. 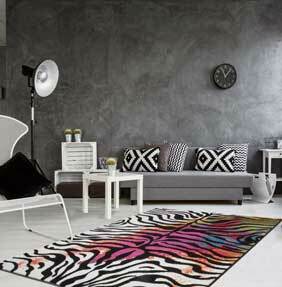 The designs within the rugs range from modern lines to colourful shapes and even a multi colour zebra – each creating a specific effect in your room. The way that these rugs are woven and the high quality yarn that is used means that although they are cheap rugs, they are also durable, long lasting and stain resistant – the perfect addition to any space in your home, even high traffic areas such as hallways. So if you need a statement rug to tie in with your curtains, cushion covers or ornaments, then the Guayama collection will have something to offer.